I'll be traveling this week so "Music for Fridays" comes early. The incomparable Jim Carrey from the movie "The Mask"
There is something mesmerizing about watching Shockwave40 videos. Sort of like shaking up a snow globe and watching until all those white bits settle to the bottom. Shockwave40 shoots his videos from the shore and his videos most often feature one class of boat. He does a good job, camera steady and zoomed in. Since this is England most of the featured dinghy sailors are very competent. His water gurgling soundtrack sounds as if it is added on. I did feature on of his other videos in January. And then the solitary Europe dinghy. 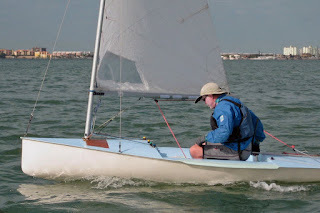 In this video, the skipper looks remarkably similar to USA Mothist, Mike Parsons. Take a Star Trek geek who inexplicably gets the girl, drives to Lovers Lane and then it all goes downhill fron there (note; this is an English video so the steering wheel on the cars are all on the wrong side - plus the cars are sooo... small). I like the mismatched door on the car; obviously a junk yard replacement for one that got crunched ........... another DIY fixer upper. Conan O'Brien and Stephen Colbert, mano a' mano. Dee Caffari, our other women in the duo we've been following around the world, finished in sixth on Sunday. She was three hours behind fellow Brit, Brian Thompson, with whom she has been locked in a duel since the Southern Ocean. Her mainsail had vast areas without any mylar, just high tech string netting. A sterling accomplishment and when the interviews with Dee after making landfall pop up on the Internet, I'll link to it. Meanwhile two videos from Cowes Online . The first has interviews with the top two Vendee Globe finishers (in English) and some footage of the Brits, Sam, Brian Thompson, Dee Caffari, Steve White racing up the Atlantic. It is interesting that Armel Le Cléac'h finished second in his first race around the World and at a young age, 31. I can close my eyes and Steve White sounds just like my uncle Roy. The second video has more Sam Davies, including her press conference ashore. The Classic Mothists decided at the 2008 Nationals to trial full length battens over the next two years. I know this will get a big whoop-de-doo from our International cousins with their fathead mains and see thru mylar sails with camber inducers. The Classicist's agree we should see increased durability but whether there will be any performance advantages given our low roach sails is open to debate. We are limited to a max of four battens and how many to make full length and how many to make short is the conundrum. The 2009 Midwinters were the first regatta where full battens were allowed and surprisingly none of the top dogs had converted. Two of the Europe dinghy sailors were the only ones. Greg Duncan on his beautiful wood molded Europe had three full battens that followed the seams and one short batten above the clew. George Albaugh in his 2004 Olympic trials winner Europe had three full length battens that ran horizontal with a short one above the clew. On George's sail you can see the old position of the short battens by the inboard circle reinforcements left behind. A professionally produced video of 49'er and Tornado racing. Not sure what the Volvo Champions Race is about but looks to be short course racing close in for spectator appeal. I like the Polish 49'er capsizing on one of the RC boats at 34 seconds into the video. Tell me again, What was ISAF's rationale for dropping the Tornado from the Olympics??? Sam Davies finished third across the line, crossing early Saturday morning. She will drop to fourth, as it looks like Marc Guillemot, with his 50 odd hours of redress for standing by Yann Eliès will make up the difference. Marc Guillemot has been sailing the last 700 miles without a keel, but light airs off the French coast have helped his cause. As Sam herself admits, third across the line is an incredible result and one that no oddsmakers would have taken at the start of the Vendee Globe. No doubt she has become the media darling of this race with her ready smile and upbeat video reports. Take nothing away from Sam; she took a 9 year old boat and raced it hard around the world. She is one tough cookie. Also tip of the hat to her shore team as Roxy had very few problems. Take all those gazillion songs written about love; passionate love, unrequited love, love gone south, schmaltzy love, eternal love, physical love, love at first sight, etc. etc. ................... Which ones will be worthy of "Music for Fridays"? Jason Mraz "I'm Yours", this one an acoustic version he did in Korea with his bongo sidekick Toca Rivera. Another boppy tune that you will find reverberating around your head, the tune emerging in whistles or hums at odd moments. The second tune, a John Prine tune "In Spite of Ourselves" with Prine acoompanied by Iris Dement. Prine, always quirky, looks at love from our lowest common denominator, the not so nice, even eccentric personality traits that are always hidden on the first dates but, when they emerge, endear lovers even more. Most of the Classic Moth fleet are active in building or restoring their Moths. I am always interested in YouTube dinghy building videos. The Quetzal sailing dinghy is a 13'5" assymetric/trapeze singlehander that is offered in a plywood kit by Competition Composites of Canada. Around $7k will get you the complete kit though I admit I am not too taken with the concept of flying an assymetric while singlehanding. If I wanted a spinnaker, I'd take up two handed sailing and let the crew handle it. There are two YouTube videos up documenting the build of a Quetzal. WARNING! Epoxy is toxic and a strong dermal irritant. Extended use of epoxy without protection (latex gloves, long sleeves) can result in extreme dermal allergic reactions. Many long time boatbuilders cannot work with epoxy because they did not take the proper precautions early. Hipjazzbone should be using gloves at a minimum. Hopefully Hipjazzbone will keep us posted on his progress. Dee Caffari is in a nip and tuck battle with Brian Thompson for fifth at the moment. Samantha Davies, ever the poet, soaking in the beauty of the day. Dee Caffari;s smile is cracking larger and large as she gets close to the finish. 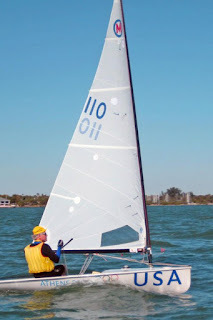 As I get older, I make mistakes .... BIG MISTAKES in my sailing regattas. 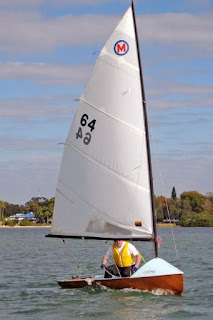 At the 2008 Classic Moth Nationals, I capsized upwind, had an OCS, and T-boned Joe Bousquet at a weather mark. 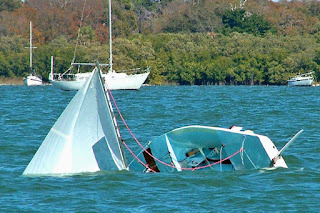 At the 2009 Mdwinters, in race 2, I had the mainsheet knot come undone and the mainsheet snake itself through the boom blocks. In the unintended stop to fix the problem, I never got back to the group I had been dueling with. In race 4 on the second reach, I was pushing the boat hard by the lee. Mike Parsons, who can go deeper with his unstayed rig had already gybed over but I persisted. Not for long! The sail unloaded .... the Moth, already heeled to weather, took another quick lurch and despite my quite comic efforts to climb the mountain, spun out and capsized. Picture from Amy Linton............Double click on pic for higher resolution. Capsize to weather is always the worst and I seem to do it regularly. It always involves a double capsize to get going again. Step1, get the boat up and it capsizes again to leeward. Step 2, climb onto the daggerboard and right the Moth from the weather side. There was the option of riding the daggerboard under the water to quicken the process but the water seemed too cold and I wussed, instead swimming around for the second try. I ended up last when all this was sorted out. I got one boat back by the finish but there was my throwout! I had some decent starts but on two of the starts in the Midwinters, I lost track of where I was in the sequence and was rewarded with some disasters in the second row. They say the human brain can slow time down in emergency situations. My brain was doing a good job of replicating this behavior just trying to start a sailboat race. Finally I had a tendency to hit the weather mark, doing this twice in the Midwinters. Why all these mistakes? Impatience? An inflated sense of how my reaction reflex used to save me (remember the quickness I had in my 20's). Who knows? When I am in the midst of flailing about, I may grind my teeth at my incompetence, but age has at least given me the wisdom to laugh at these foibles. Tip of the hat to Tillerman who also regularly documents his failings on the race course. Pictures are from Amy Linton. Music is "Double Trouble" by Sly and Robbie from the CD "Best of Ska, Vol 10"
Checked on some old "Music for Fridays" and the Warner Music Group Police has forced YouTube to yank some of my favorites. If you go back through "Music for Fridays" you may find some broken links. Sorry! This weeks selection; Crystal Waters "Just Say Hey" also suffers from being yanked from YouTube from time to time. Well it's up on YouTube at the moment. "Just Say Hey" is a poppy dance tune featuring some of the old stars of the Washington Bullets pro basketball team (not to be confused with the current and abysmally bad Washington Wizards basketball team). I recognize Bullet's star Juan Howard and I should come up with some other names from the Wizard's teams of the mid 90's era ............ but I draw a blank. Amy Linton shot a quick video of a first reach on one of Sundays races. The top two finishers in the regatta are featured at the front; Jeff Linton in 102 and Mark Saunders in 54. Vendee Globe: Michel Desjoyeaux wins. While I was in sunny but chilly Florida, Michel Desjoyeaux on Foncia won the Vendee Globe around the World race. He is known as "The Professor" but in this race he was "The Dominator". At the start, Michel Desjoyeaux, had to head back to port to fix a leaking ballast tank that had knocked out his generator. He spotted the fleet about 700 miles, caught up to the leaders in the Southern Ocean, took the lead in the race just below Australia and, in the Atlantic, had piled on another 500 miles on second place Roland Jourdain before Roland Jourdain had to retire to the Azores when he lost his keel. It was a performance worthy of that fabled remark to Queen Victoria when the yacht America raced in England, "You highness there is no second". Well I'm back from Florida. We spend almost as much time on the road as at the sailing venue (the Classic Moth Midwinters are scheduled over a weekend) but it is still a gas. As it has been over the past three years, the Midwinters were hosted in great form by the Gulfport YC on Boca Ciega Bay. Jeff Linton won again this year, but only by a point in a tough battle with Mark Saunders of Norfolk. Race 1 and 5 were light and fluky with major changes throughout the fleet as some massive windless holes took over the course. Races 3 and 4 had a pleasant 8-12 westerly seabreeze. Sundays three races were from a easterly direction in the 5-8 knot range with some large shifts between left and right sides. Fourteen Classic Moth's showed up, 13 made it on the water. Many thanks go out to Rod Koch - regatta organizer, Dave Ellis - PRO, Jeff and Amy Linton - food and entertainment, and all the Gulfport YC volunteers that make this regatta happen. I'll have more on this regatta as time goes by.